I was very flattered to have been featured in Amia this week. Amia is an exciting online monthly magazine for women of all ages and backgrounds. What do you think is most special about the French way of life? I love the way everyone acknowledges and greets each other, even strangers like me. The French seem to take time to interact with each other. This sometimes means things can take a little longer, which a first can be a little frustrating, but once you accept this you start to value a slower and more thoughtful way of life. Another thing that I have observed is the importance of family, in particular the respect and affection shown by youngsters towards the older generation. You often see three generations of a family in restaurants - all interacting happily together. 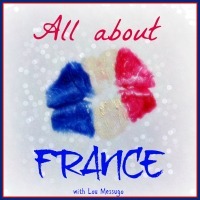 What prompted you to spend so much time in France? My husband and I were looking for a place to retire to in the future. We wanted to live in a landscape similar to southern England - which we love. Brittany is very similar to Devon and Cornwall - but property is cheaper there and it feels less crowded. We both love the peace and quiet of the countryside and we are at our happiest when walking on the local trails. The properties that we bought in central Finistere were rented out as gites by the previous owner. We found ourselves the unexpected managers of two holiday lets. The learning curve has been steep! Therefore, one of the reasons we spend so much time at our holiday homes is to try to understand what our guests experience when they stay in them. This allows us to improve them and add the little touches that we feel are important, like an internet connection, or to work on the garden to make it more usable and appealing. The garden has been a major project that is now starting to pay dividends. What are some of your happiest memories of times spent in France? My happiest memory is waking up on the first morning after we took possession of the property and hearing nothing but the birds singing. It is one thing viewing a property a number of times - but actually staying there was the proof that we had made the right decision, that is, no nasty surprises. The peace and tranquillity are exactly what I had hoped for. My next happiest memory was actually spending some time relaxing on one of our sun loungers one afternoon earlier this year. I am not very good at sitting still, as my husband will tell you, so simply sitting in the sun on our terrace whilst enjoying a book and a glass of red is a fairly unusual experience for me - one to be cherished! Other happy memories are of leisurely walks in the local countryside with a simple picnic lunch of baguettes and a sweet treat from the patisserie. You can walk for miles in Brittany without meeting another person. The views are stunning, whether from the top of a heather clad moor, a spectacular rugged coastal scene or a picturesque river valley. What are some of your favourite places to visit/spend time? One of my favourite places to visit is the lakeside town of Huelgoat and its magical forest. This popular town is only a short drive from our holiday home. We love to pop into one of the boulangeries/patisseries in the main square and treat ourselves to a fresh baguette and French pastry. These are stowed in our backpacks in readiness for a hike through the boulder strewn forest. The beauty here is that you can access the verdant moss-clad woodland straight from the town, as it is lies at the forest edge. You can just take a short easy stroll and admire the huge boulders of the "Chaos" at the entrance of the wood, or take a longer walk along one of the many marked trails, whichever you have time for. We always make a point of visiting the forest at least once during our stays in Brittany. Every season has something new to offer. There are many legends associated with the forest including Arthurian tales and the story of a princess who used to throw her lovers off a cliff once she was bored with them! How do you typically like to spend your time when you visit France? When we are not working on the gites or doing some gardening, our favourite activity is going for a long walk. I think we have acquired nearly every walking guide published in English for Finistere and a few French ones too. One of the challenges has been to translate some of the French walks into English and then seeing if we can follow them without getting lost! So far we have been successful, with only a few deviations, but that is all part of the adventure. It's important that we do this as we provide copies of the walks for our guests in each gite. We like to vary our walks - one day we may have an easy stroll along the towpath of the Nantes-Brest Canal, another day a more strenuous hike on the moorlands of the Monts D'Arree, though none of these reach over four hundred metres, so they are not too daunting. We particularly enjoy exploring the coastal paths of Brittany, which we can easily reach being in the centre of Finistere. The coast of Brittany varies from wide golden sandy beaches to rugged cliffs and isolated coves - littered with huge granite boulders carved into fascinating shapes by the wind and waves. Galette, a savoury Breton treat! What are some of your favourite French varieties of food and drink? Think of Brittany and you naturally think of crepes and cider. Every town and village has at least one creperie and you will often find food vans selling crepes on the side of the road. For main course, you can have a galette, which is a thin buckwheat pancake. These are usually served with a savoury filling. Pudding comes in the form of a crepe which is made from white wheat flour, filled with, you've guessed it - a sweet filling! My favourite filling is Caramel au Beurre Salé (salted caramel) which is a local speciality. Both galettes and crepes are traditionally accompanied with cider, served in a special bowl or cup. Of course, with over three hundred miles of coastline, Brittany has to be one of the best places in the world for fresh seafood. My all-time favourite is scallops and I take every opportunity to indulge myself when I see them on the menu. My next favourite seafood is prawns which are always large, fresh and succulent. Just a little squeeze of lemon is required to enhance their flavour. As for drinks, I like a Kir Breton (cassis and cider) for an aperitif followed by a crisp bottle of Sancerre when I'm having a seafood supper. If we are having something heavier like the traditional Breton dish of Pot-au-feu made with local vegetables, a glass of red goes down well. What do you miss the most about France when you are not there? The peace and tranquillity of the countryside. It really is as simple as that. Oh, and the empty roads. It's always a rude shock returning to the UK and getting stuck in a traffic jam.